The Avon EB950CR Armstrong Barrier is a high security rising arm barrier that has been PAS 68 impact tested and offers a high level of protection where central roadway foundations are not possible / practical. The barrier can withstand direct impact forces in excess of 720 KJ, and provides shallow mounted protection to sites from extreme Vehicle Borne Improvised Explosive Device (VBIED) attack. The EB950CR is a highly dependable security product that will easily interface with a wide range of control equipment. Assembled in our fabrication facilities using heavy gauge materials to give maximum strength and durability. The EB950CR is a traditional rising arm barrier security barrier with the benefits of high level physical protection. 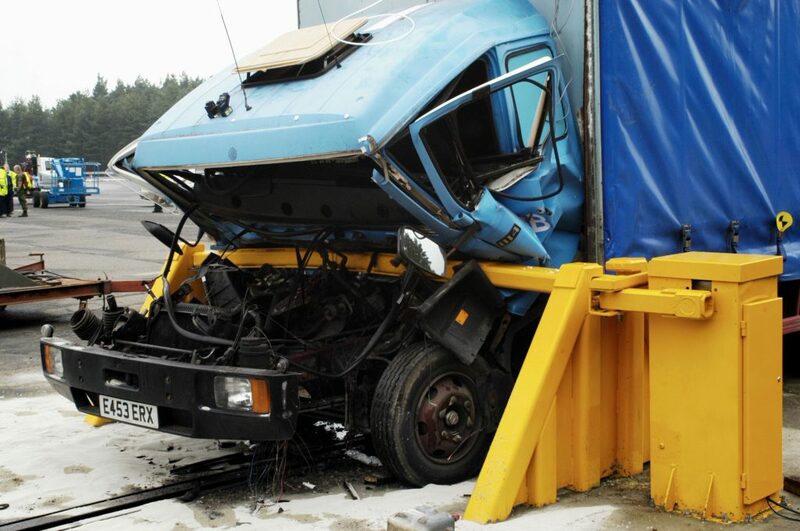 Independently physically impact tested in accordance with the BSi PAS 68 by the Transport Research Laboratory (TRL) it achieved a PAS 68 classification V/7500(N2)/48/90:0/0 and remained operational after the impact. The high security barrier comes with a hold to run control as standard, the hydraulic power pack is controlled by a programmable controller and can be customised to interface with a wide range of access control equipment to suit specific customer requirements. Available configurations include (but are not limited to) inductive loop systems, card readers, communication equipment and manned guard emergency systems. In the event of power failure a manual pump is provided to ensure operator control is maintained. The EB950CR PAS 68 security barrier is an Electro-Hydraulically operated rising arm barrier with arm widths of up to 4.5m span. 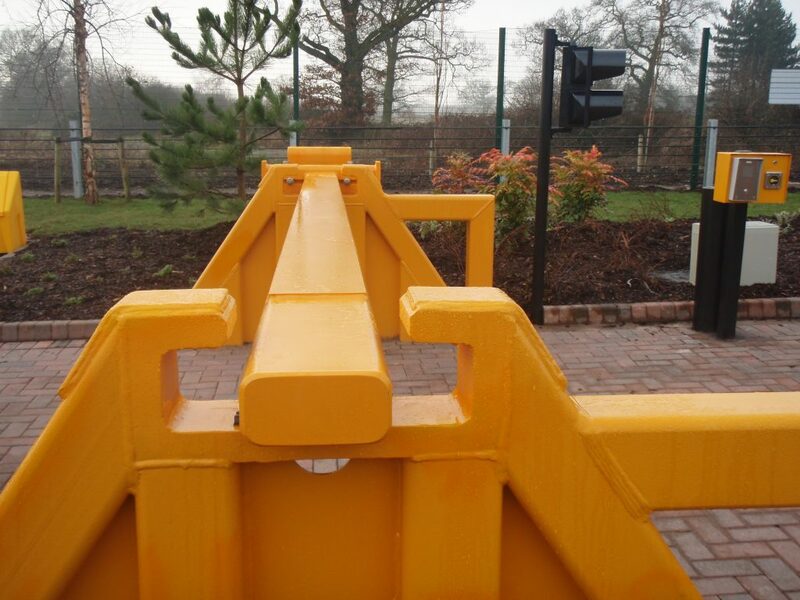 The barriers arm sits 1 m above the roadway and is supported by 2 side support frames. During impact the arm slides into a locked position protecting the main drive mechanism from damage. Construction: The boom catcher frames are fabricated from heavy steel sections, which are anchored into the foundations: they are designed to support the boom in the lowered position and to take a full impact load. The recess in the catchers prevents the boom from lifting when impacted. Outboard extensions inhibit the vehicle running up the catcher frame. The boom is fabricated from heavy steel section clamped to a lift yoke which is designed to slip through its clamp in the event of a collision, to engage under the catcher frame recesses. The lift assembly comprises twin cranks welded to a solid shaft, which rotates in non-metallic bearings. A heavy-duty steel yoke is welded to the outer ends of the shaft. The crank is rotated through 90 degrees by the action of a hydraulic cylinder. Main barrier cabinet is constructed from steel plate; it houses the hydraulic equipment/reservoir, drive mechanism and electrical enclosure.